Popoh beach is the interesting tourism object in Tulungagung regency. In this tourism object, you can enjoy the beautiful of nature scenery, astonished with a thousand temples; enjoy the swimming pool, and fauna. This tourism object has managed by the region government of Tulungagung, together with Retjo Pentoeng Cigarettes Company. 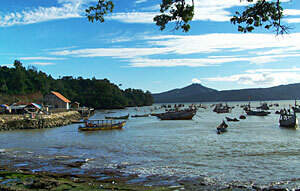 In this Popoh Beach is also equipped with lodges facility, fish market, marine tourism, and a few places for fishing. The communities around always held a traditional ceremony called ì Labuh Semboyoî by wash away sacrifice of two goatís head to the sea for the ìrulerî of south sea (Indonesia Ocean). That ceremony is aimed to get a lot of fish from south sea. There is onyx handicraft place as Tulungagung souvenirs and located along the road way to Popoh, Boyolangu, Campurdarat, Besuki. We can reach it by motorboat to walk around Sidem Beach, Klatak, Gemah and Bayeman. Popoh Beach is presents tourism a lot and has playground for the kids, smooth spoon beach, quay wall, sea fish market, seafood, etc. The other tourism facilities of Popoh beach is lodges for the visitors who want to stay here for a while and enjoy Popoh beach longer. The place of fishermen is at east side and stick out to sea. If we lucky, we can see the fishermen get their fish from sea and sell it with affordable price. Almost every holiday and red day, this tourism object is always full of visitors, both from Tulungagung around also foreign tourists.